It's the worst kind of déj vu: On May 19, 2015, an oil spill near Santa Barbara blackened the California coast with tens of thousands of gallons of crude oil — a tragic reminder that oil production is dirty and dangerous from start to finish, and we won't be safe from these tragedies until we transition to clean energy sources. 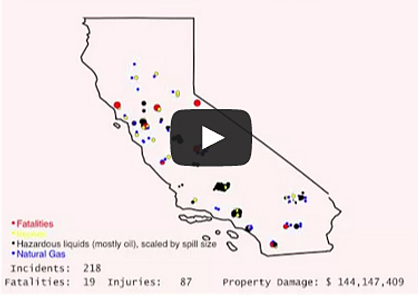 Watch this time-lapse video of California pipeline incidents from 1986-2014. A ruptured oil pipeline dumped more than 100,000 gallons of crude oil onto the coast, including at least 21,000 gallons that leaked into the ocean. Crude oil from the aged and broken pipeline fouled Refugio State Beach and created a 10-square-mile oil slick that threatened, injured and killed wildlife including sea otters, brown pelicans and humpback whales. Plains Pipeline, the company that owns the pipeline involved in the spill, is responsible for numerous oil spill incidents and has been repeatedly warned by government regulators to improve its safety procedures. Since 1986 more than 600 oil and gas pipeline spills, explosions and other incidents in California have caused at least $769 million in damages, 200 injuries and almost 50 deaths. Oil spills inevitably take a heavy toll on wildlife. A week after the spill, witnesses were still spotting whales, dolphins and sea lions swimming in the oil slick, birds covered in sticky oil struggling to fly, and dead fish and lobsters washed up on the shoreline. The full extent of damage won't be known for years. Official reports of dead, oiled wildlife include sea lions, brown pelican, fish and a large number of invertebrates. Two common dolphins have been found dead. As of June 15, wildlife rescuers had collected 91 dead marine mammals and 185 dead birds. Wildlife rescuers are also recovering live animals from the sticky, toxic oil and sending them to rehabilitation centers to be cleaned, with hopes of saving them, including elephant seals, sea lions, brown pelicans and western grebes. As of June 15, 57 marine mammals and 57 birds had been recovered live and covered in oil. What Will the Oil Spill Kill? Sadly, this oil spill hit a coastal area well-known for its incredible diversity of marine life. The Santa Barbara Channel is home to numerous whales, dolphins, southern sea otters, seabirds and more than 500 species of fish. Endangered blue whales — the world's largest animals —concentrate here to feed in large numbers in summer, and it is the migration path for gray whales and four other whales listed under the Endangered Species Act. Oil spills can harm whales, dolphins, seals and sea lions when animals inhale toxic fumes from petroleum chemicals floating at the surface, and when they eat oil-contaminated prey or swallow oil. Exposure to toxic oil fumes has been recently recognized to cause mortality in whales and dolphins, even years after accidents. A recent study found the spike in deaths in bottlenose dolphins in the Gulf of Mexico during and after the Deepwater Horizon disaster was associated with lung and adrenal lesions caused by oil exposure that led to breathing difficulty. Birds and sea otters that become covered in oil can quickly lose their insulation and die from hypothermia. Oiled birds returning to their nests can contaminate their eggs and chicks with oil. California brown pelicans are frequent victims of oil spills when they plunge-dive into oiled coastal waters to catch fish. Once near extinction due to DDT pesticide contamination, California brown pelicans made a remarkable recovery with help from the Endangered Species Act, but these birds have suffered large-scale breeding failures in recent years due largely to failing food supplies. This oil spill, which hit near the pelicans' only two U.S. breeding sites in the Channel Islands, makes matters worse. Other seabirds at risk from the oil spill include the rare Scripps's murrelet and ashy storm petrel, only found in California and Baja California, which use the waters of the Santa Barbara Channel as core feeding grounds. The oil spill is less than 20 miles from Cojo Anchorage near Point Conception, where the threatened southern sea otter has begun to make a comeback in recent years. Beach-nesting birds like the endangered Western snowy plover and threatened California least tern are also in harm's way. Booms were deployed to protect their nesting and foraging habitats from oil contamination. Although numbers of both species have increased due to their protected status, disturbance like oil spills that tarnish beaches are a major threat, especially during the nesting season in May and June. Marine and coastal vegetation may also suffer tremendous and undetected impacts. The fronds of kelp beds, which usually float during low tide, can be covered by oil and can die after just a few days of exposure. While it is still too early to estimate the long-term effects of this new oil spill on wildlife, experience from past spills clearly shows that the harms can be severe and long-lasting. The 1969 Santa Barbara oil spill, which leaked several million gallons of oil from a platform blowout, killed thousands of birds, fish and intertidal invertebrates, along with many dolphins, elephant seals and sea lions. It took around 45 days to clean the beaches, but several decades for the area to recover from the impact. The sticky, toxic oil coating Santa Barbara beaches after a pipeline leak on May 19 is the latest reminder that oil production is dirty and dangerous from start to finish. Our water, air and climate will never be safe until we end fossil fuel development altogether. The Refugio oil spill recalls the tragic 1969 Santa Barbara oil spill that angered the nation and helped to spark the environmental movement. Let this one mobilize us to keep the oil in the ground. We're calling on the state and federal regulators to shutter that leaky pipeline forever and to decommission coastal oil projects that feed it and endanger our coast and climate.